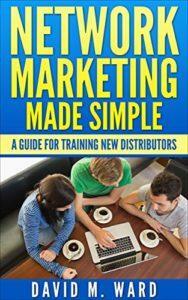 I recently read the book Network Marketing Made Simple: A Guide for Training New Distributors. It’s a great book by David Ward. My close friend Catherine sent me an Amazon gift card for my 40th birthday, so I figured I would order some books for myself. I’ve enjoyed David’s other books Recruiting Up and Recruit and Grow Rich, so I figured I would check out his books as well. 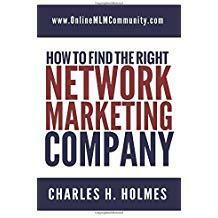 I ordered this book along with his other book Fix Your Network Marketing Business, which I also enjoyed immensely. Each chapter features three ideas or tips about a certain topic. Some of the topics include getting started right, how to spend your time, recruiting, approaches, exposures, handling objections, using three-ways calls, leadership tips, and finding prospects. What I want to do in the paragraphs below is share my favorite David Ward quotes from Network Marketing Made Simple. If you look at my copy of the book, you will find more than 100 underlined passages. Rather than share all of his secrets, I simply want to share some of my favorite quotes from the book. These quotes are listed by where I found them in the book. Enjoy. # 1 The best way to train new network marketing distributors is to get them doing the activities as quickly as possible. # 2 Don’t judge your business by what happens your first few months, or even your first year. # 3 In the beginning, you work hard and have small results. A few years from now, you could be earning an amazing income without having to do much work at all. # 4 Success is network marketing is about doing things that duplicate. # 5 No matter how much you can do yourself, a team of people can do more. # 6 Successful distributors are consistent. # 7 It’s better to build the business daily because the work becomes a habit. # 8 Don’t talk to anyone until you have been trained. # 9 In network marketing, the facts are important but it is often the stories that inspire people to act. # 10 The most important story to share is your own. # 11 As a new distributor, one of the first things you should do (and ask your new distributors to do) is to put your work schedule on your calendar. # 12 Your top priority is recruiting and retailing. This is what generates income and builds your business. # 13 Talk to as many people as you can, as quickly as you can. # 14 The best way to contact people is over the phone. # 15 Everyone can hand out a DVD. Not everyone can do a presentation. # 16 Most people don’t sign up as a distributor the first time they see some information. # 17 One disadvantage of the product first approach is that the prospect might not want to order any products when you first approach them (for whatever reason), but if they knew about the business opportunity, and they were interested in that, they would probably be more likely to place a product order. # 18 Let the tools do the talking for you. # 19 you’re not sure if someone is interested, ask them. # 20 If you have to talk someone into signing up in the business, assuming you could do that, you would have to talk them into doing the business. # 21 When someone tells you no they are doing you a favor. # 22 Your number one objective with a new distributor is to help them recruit their first distributor. # 23 Network marketing is an event-driven business. # 24 One of the most valuable skills in network marketing is the skill of promoting. # 25 Continually look for reasons to notice your distributors doing something right. # 26 Every successful network marketing business is built through the leadership of a relative small number of distributors. You don’t need to find or develop hundreds of leaders. You only need a few. # 27 When you see someone in your organization who is working the business without depending on you, you know you have a leader. # 28 Wherever you find them (leaders), stay close to them, help them, encourage them, but don’t get in their way. # 29 Most distributors aren’t leaders. But every distributor in your organization can lead you to leaders. # 30 You never know who will become a leader or lead you to one. # 31Stay in touch with your customers and inactive distributors. # 32 Become the person you want to attract. # 34 How do you recruit more distributors? You talk to more prospects. # 35 You don’t have to be good to be a good recruiter. Talk to more people. # 36 When everyone else is approaching one or two people, go talk to ten. # 37 Quantity will lead to quality. # 38 Recruit professionals and business owners and salespeople. Recruit the sharpest, most successful people you can find. # 39 The best recruiters and biggest income earners in network marketing make personal development a priority for themselves and their teams. # 40 To recruit more distributors you need to keep your pipeline of prospects full. # 41 It has been said that when you sign up a new distributor, 80% of their training is done. They saw how you approached them. They heard what you said. They watched what you did to recruit them and that’s how they believe the business is done. # 42 Model the behavior you want to duplicate. # 43 Even when you follow the system consistently, even though you show your team the right way to build a business, not everyone will follow suit. # 44 As your team gets bigger, you can’t give everyone the same amount of your time. Invest most of your time working with the ones who commit to following the system. # 45 Every network marketing organization has attrition. # 46 Don’t stop recruiting front line distributors into your organization. Don’t stop working with your downline leaders. Don’t stop building your business until you are truly ready to retire or move onto something else. # 47 Network marketing is a numbers game. # 48 If you’re doing everything right, but not seeing the results you want, you’ve got to increase your numbers. # 49 By far, the biggest reason distributors struggle is lack of belief. # 50 An ounce of doubt and you’re out! # 51 Whatever you do, don’t compare yourself to others. # 52 Many distributors who struggle have unreasonable expectations about how long it will take to become successful. # 53 Most people overestimate what they can do in one year and underestimate what they can do in five years. The book is published by Golden Lantern Books. You can buy it in softcover or kindle format. It features 126 pages. David Ward is an attorney, marketing consultant, and six figure income earner in network marketing. You can visit his website here. Overall, I give this book 4 of 5 stars. It is easy to read, well-organized and loaded with great tips. It would benefit any new or experienced network marketer. There you have it folks. I hope you enjoyed my book review of Network Marketing Made Simple by David Ward. Do yourself a favor and order yourself a copy of this book and study it. You will be glad that you did. On a side note, which quote listed above is your favorite and why? Leave a comment below to let me know what you think. I look forward to hearing from you.